In the aftermath of the strong winds, torrential rain, flash flooding and landslides that killed seven people and left a trail of destruction and damage in favelas such as Rocinha, Vidigal, Complexo do Alemão, and Barra de Guaratiba on the night of February 6, the Rio de Janeiro City Council launched a Parliamentary Commission of Inquiry (CPI) on Flooding. Led by city councilor Tarcísio Motta of the Socialism and Liberty Party (PSOL), the CPI intends to “ascertain the circumstances and consequences caused by the storms that recurrently affect the city” and outline the responsibilities of city officials in preventing and mitigating future floods and landslides. Renato Cinco of the PSOL is the CPI’s official rapporteur and Marcelo Arar (Brazilian Labor Party–PTB), Rosa Fernandes (Brazilian Democratic Movement–MDB), and Tiãozinho do Jacaré (Brazilian Republican Party–PRB) also serve as commission members. 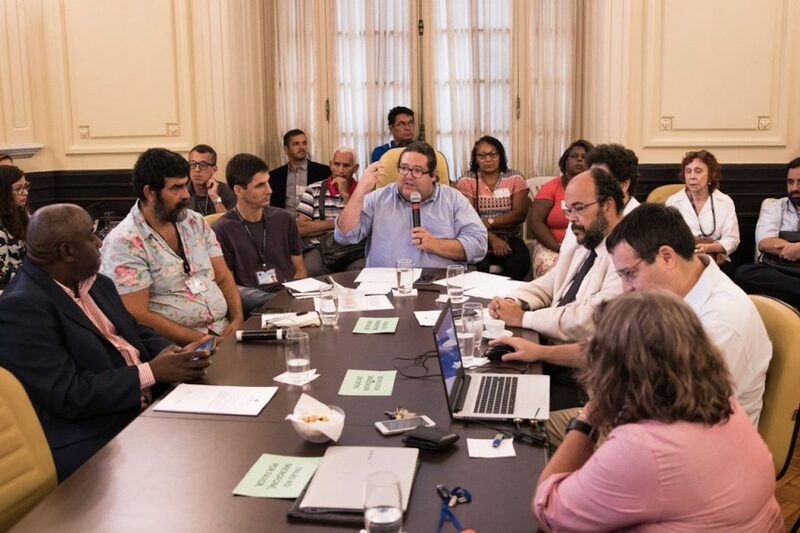 The CPI’s inaugural public meeting took place on Thursday, March 28 at the Rio de Janeiro City Council in Cinelândia, in downtown Rio. Motta began the day’s proceedings with brief remarks about the importance of holding public officials accountable for improving flood preparedness in Rio de Janeiro. Motta lamented that several of those killed by February’s floods and landslides were favela residents and insisted that the CPI must improve public services in vulnerable communities where floods are particularly deadly. After his introductory remarks, Motta ceded the floor to two Federal University of Rio de Janeiro (UFRJ) professors, Dr. Ana Luiza Coelho Netto—who coordinates the Geo-Hydrology Laboratory (GEOHECO) at UFRJ’s Institute of Geosciences—and Dr. Leonardo Esteves de Freitas. Both professors specialize in geography, geoscience, and environmental biology. Professor Netto presented first, explaining to attendees that increased deforestation in forests and national parks outside of Rio de Janeiro in recent decades has catalyzed a corresponding increase in flooding and landslides within the city proper. 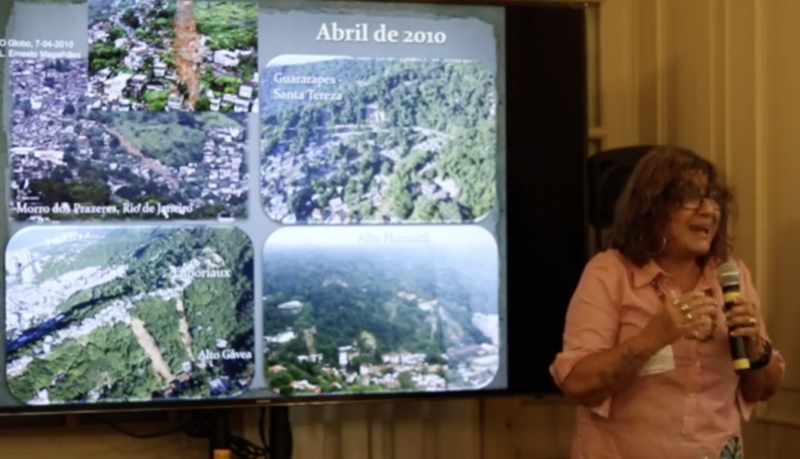 She used maps and images of past flooding and rainfall patterns to demonstrate that “forests are functional” in that they can mitigate the impacts of heavy rains in Rio de Janeiro. However, as the city has expanded and vegetation has been cut down in places like the Tijuca National Park, rainwater has begun to flow freely down mountainsides and into human settlements. Netto argued that the best way to protect the entire city of Rio de Janeiro from flooding is to reforest peripheral parks and mountains. She elaborated by saying that from a human rights perspective, sanitation systems in favelas should receive more public funding, but that drainage systems alone cannot protect favelas or other hillside settlements from the disproportionate inundation they receive. Netto’s analysis provides an explanation for the damage done not just to favelas, but also to upscale communities on hillsides, such as in the São Conrado region, where flooding affected wealthy neighborhoods with developed drainage systems as well. “Vegetation matters,” Netto emphasized, and policymakers must be held accountable for protecting forests to ensure health, safety, and dignity for their citizens. Netto’s remarks stand in direct contrast to the rhetoric espoused by Rio de Janeiro Mayor Marcelo Crivella and Governor Wilson Witzel. After major floods in 2018, Crivella erroneously blamed environmental regulations and tree cover in the city for increasing flood damage. According to the science presented by Netto, Witzel is advocating for “flood prevention” policies that will actually increase flooding and landslides in the future. Professor Freitas spoke next, focusing his presentation on environmental justice in Rio de Janeiro. Freitas talked at length about how “vulnerability is a social condition” and that vulnerability to environmental risks like flooding and landslides is directly linked to other forms of socioeconomic vulnerability. 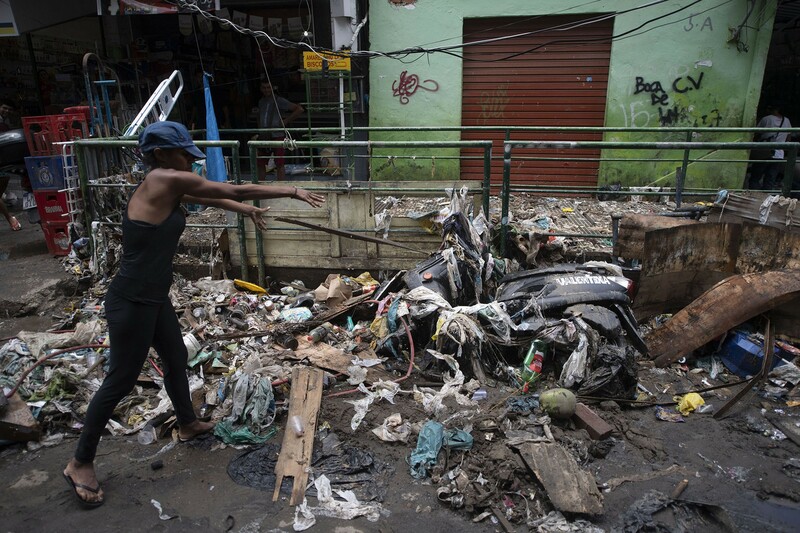 “It is too easy for people to attribute disasters to nature,” Freitas argued, highlighting that the disastrous impacts of extreme weather events in Rio de Janeiro are directly caused by political and economic marginalization of favelas. Freitas condemned the displacement and eviction of favela residents due to flood risks, emphasizing that the relocation of these communities to places with no schools, banks, hospitals, or facilities only “continues the disaster” and increases the overall vulnerability of these communities. This directly contradicts the public policies proposed by Mayor Crivella, who has blamed the “disorderly occupation“ of hillsides by favela residents for the fatalities during floods. In the aftermath of February’s floods, Crivella emphasized the technical inviability of improving drainage systems in favelas such as Rio das Pedras (located in Rio’s West Zone), suggesting that relocation is the best solution to the community’s flood problem. In contrast, Freitas posited that from an environmental justice perspective, favelas must be allowed to remain where they are. As such, building community resilience through environmental education programs, flood preparedness drills, and dialogue with policymakers is key to mitigating disasters in the future. After thanking the professors for speaking, Motta stressed to attendees: “We need Rio de Janeiro’s lawmakers to think about how to save lives in the next few years. We cannot remain silent about this situation.” He then opened the floor for questions and emphasized that constituents who had been impacted by flooding were especially encouraged to voice their concerns. No other city councilors or attendees chose to speak, but Motta asked the professors a number of questions about flood policies that were formulated with input from his constituents and fellow city councilors. Motta told the CPI that “one of the most repeated phrases after the events of February 6,” especially by politicians such as Mayor Crivella, “was that the city was dealing with exceptional rainfall—something extremely rare.” He asked the professors to address this statement and to evaluate Rio de Janeiro’s current preparedness to handle similarly extreme rains in the future. Extreme floods like Rio saw in February are “uncommon, but they are expected,” said Netto. “Extreme [weather] events are becoming increasingly frequent,” she stated. Freitas agreed, adding that that the city is currently not equipped to handle heavy rains and floods. Increasing preparedness “will be difficult but it is definitely possible,” he said. Since it is possible to predict that Rio de Janeiro will experience intense rains in the future, the professors believe that it is also possible to implement policies to mitigate and prevent the disastrous effects of these extreme weather events on human lives. Motta continued the conversation by stating that to prevent fatalities from flooding, the CPI must take into account that favela residents are the “most vulnerable to the impacts of rain. This is the correct interpretation for [the CPI] to start with.” He added that when he and his colleagues were “visiting communities that were hit by the rains, we found out through residents that the siren system was not triggered on February 7” to alert residents about possible flooding. The professors shared Motta’s concern about alarm system failures. Freitas added that there is a cultural dimension to emergency response. Since many favela residents view their homes as safe spaces, they are often reticent to abandon them. Moreover, they may be distrustful of warnings from authorities due to the mistreatment and negligence they have experienced in the past during extreme weather events. Netto advocated for increased communication between city officials, academics, and favelas resident, as well as “teaching people about escape routes in their communities” in order to improve Rio de Janeiro’s readiness for future floods and landslides. Motta concluded the meeting by voicing his commitment to facilitating further dialogue about extreme weather events and increasing the City Council’s ability to implement “concrete measures to save lives.” Motta and his fellow city councilors defined the CPI’s next steps and invited all those interested to participate in future meetings. On Thursday, April 4, the city councilors will visit the Court of Auditors to discuss funding concerns related to flooding. 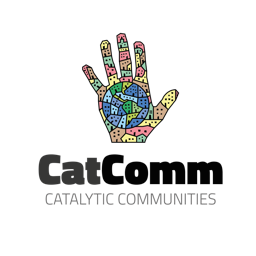 The next CPI meetings will focus on sanitation and public health and will take place on Thursday, April 11 with the participation of Dr. Ana Lúcia Brito from UFRJ’s Faculty of Architecture and Urbanism and Dr. Alexandre Pessoa Dias from the Polytechnic School at the Oswaldo Cruz Foundation (Fiocruz), and on Wednesday, April 17 with the participation of Sérgio Portella from Fiocruz and Dr. Suzana Kahn Ribeiro from UFRJ’s Alberto Luiz Coimbra Institute for Graduate Studies and Research in Engineering (COPPE). 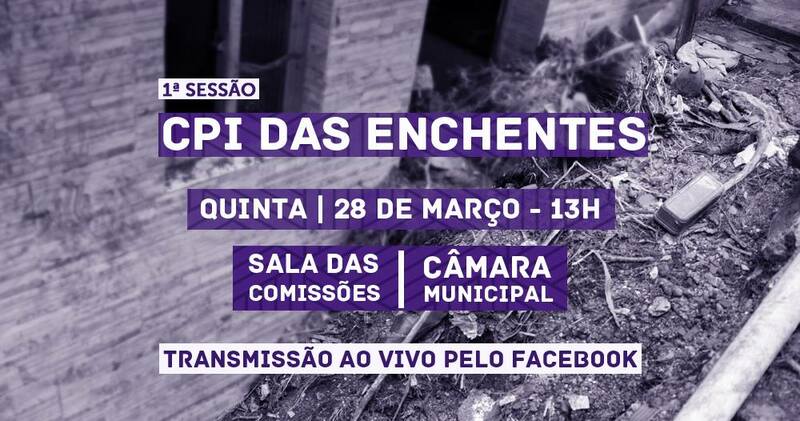 Finally, the meeting on Saturday, April 20 will heavily feature the input of favela residents impacted by February’s floods. This article was written by Rachel Mucha, and published on April 2, 2019.